Featuring Brian Culbertson, Sheila E, Euge Groove, Eric Darius, Oleta Adams, David Benoit, Paul Taylor, Marcus Anderson, and Adam Hawley! Click HERE for our Information Table locations & times during The Getaway. the 2015 welcome dinner with cecil ramirez, vincent ingagla, eric darius & BC. Join us for a night under the stars as we kick off the Getaway with our friend Cecil Ramirez, your host Brian Culbertson, Brian's band, featuring Eric Darius, Marcus Anderson, and Selina Albright in the Solera Courtyard at The Westin Verasa! Michelin Star award-winning chef Ken Frank of La Toque will prepare a delicious multi-course family style meal. Enjoy complimentary wine tasting by many of Napa's top wineries and reconnect with friends from past Getaways. Special guest artists will be performing along with our DJ's Rick & Russ! Featuring vocalist, Selina Albright and Michael Lington. And our DJ’s Rick & Russ w/CJ Flash! *You must present your PLATINUM or GOLD ACCESS CARD for entry. 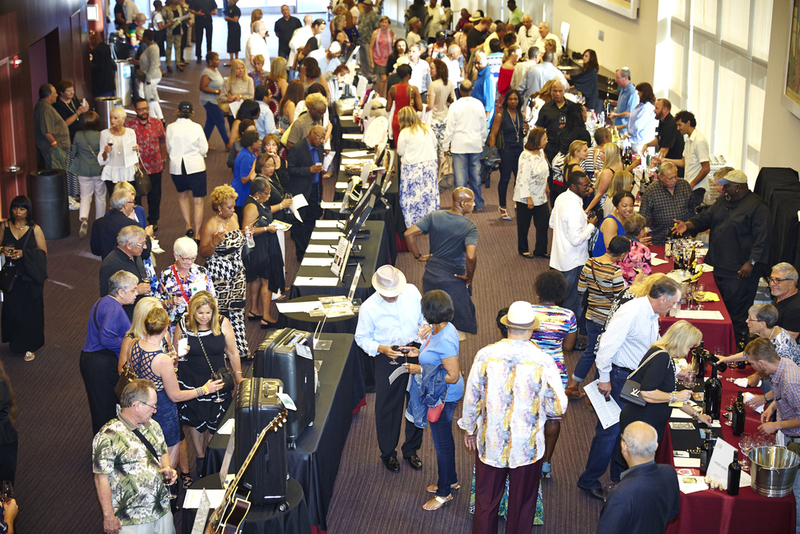 We'll kick off the 8th Annual Jazz Getaway with an amazing night of music! Brian Culbertson and his band headline with saxophonist Eric Darius back with his band to start off the night! The first of 3 After Parties at the Westin. Our DJ's will be spinning in the ballroom (Thursday, Friday, and Saturday). And like 2018, the hang will be spread throughout the lobby bar, Solera Courtyard, Ballroom, pool area, and of course, the cigar lounge out back! Cecil Ramirez will be hosting the Cigar Party again, sponsored by Mason & Hamlin. *Show your PLATINUM or GOLD ACCESS CARD for entry. For our 2nd Wine Down of the week, you'll enjoy more complimentary wine tasting by many of Napa's top wineries. Brian Culbertson and Eric Darius are back and will be performing along with our DJ's Rick & Russ! Featuring the iconic Sheila E and saxophonist Euge Groove! Euge Groove will be joined by Adam Hawley. The second of our After Parties at the Westin. The DJ's will spin, and the hang will continue at The Westin! Cecil Ramirez will be hosting the Cigar Party again, sponsored by Mason & Hamlin. adam hawley, marqueal jordan, and paul jackson jr. at 2017 wine down. For our 3rd and final Wine Down of the week, you'll enjoy more complimentary wine tasting by many of Napa's top wineries. Guitarist Adam Hawley and additional guest artist will be performing along with our DJ's Rick & Russ! *Show your PLATINUM, or GOLD ACCESS CARD for entry. We'll end the concert events of the weekend with an evening to remember: Brian Culbertson and Friends! Brian and his band will be joined by special guests for a show-stopping performance. Featuring David Benoit, Oleta Adams, Marcus Anderson, and Paul Taylor! Stay tuned... join the mailing list to get the news first by clicking HERE. russ getting the dance floor poppin! 10:30pm - 12:30am • "Farewell" After Party at The Westin ... see you next year!! Hang out for the final event of the 2019 Getaway to say goodbye to all your new friends before seeing them again in 2020!! The dance floor will be poppin', the wine will still be flowing, and BC & Friends will be hanging!